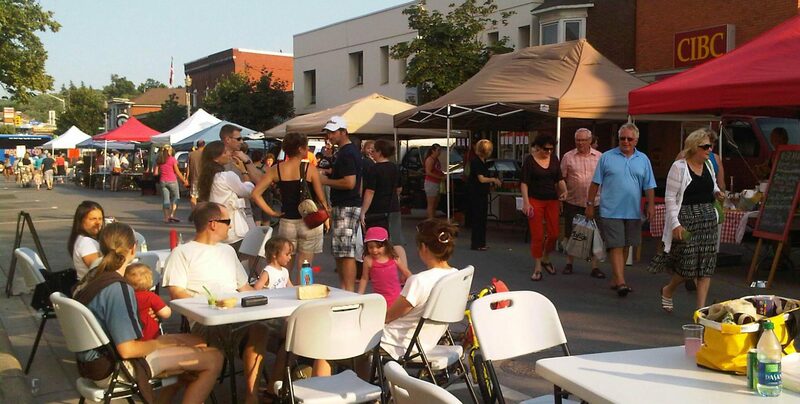 Grimsby Farmers’ Market runs every Thursday from the end of May until Thanksgiving weekend on Main Street in Grimsby, between 3 and 7 pm. The market was established in response to a growing demand by the residents of Grimsby to enjoy the freshness of “home grown” products from the Niagara Region. Set up as a “Home Grown” Market, our vendors grow their own product and take the time to answer all the questions of the shoppers at the market. We close a portion of Main Street between Christie and Ontario Streets at 1:30 each Thursday from May 31 until October 11, 2018 to set up our market so that we are ready to start at 3:00. The market runs rain or shine for the entire season.We have fun at the market, whether it is one of our many special events like Summer Solstice, Happening at the 40 or some of the new evenings we have planned for 2018. The market runs until 7 PM and the road is reopened by 8:00 when all the vendors have cleared the road. The market is run by a steering committee comprised of 4 market vendors, a community member and overseen by the Market Manager. The steering committee helps sort out new vendors each year by annually reviewing all vendor applications. They also assist in any disputes that may arise. The steering committee members are elected by the market membership and sit for a three year term.